Fan Forum > TV Shows - Past > Smallville > Allison Mack | Chloe Sullivan #73:All we want for Christmas is Chloe's Return! 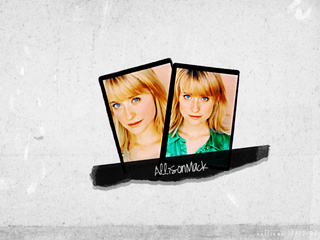 Allison Mack | Chloe Sullivan #73:All we want for Christmas is Chloe's Return! "When Allison comes to work, she gives the biggest smiles I've ever seen. Those smiles touch you in a way that she's not even aware of." She’s a very mature actress." began her career at age 4 when her mother made an executive decision that she had the personality to be on TV. Little did her mom know that she was introducing Allison into what would soon be her greatest passion in life. What ensued after this introduction has been 24 years of imagination, creativity, introspection and evolution. Christopher Lloyd and Aiden Quinn along with the role she is most well known for Chloe Sullivan. “She's so great. She's so good at her job. Just believable and likeable and smart." "Allison Mack and I are really close. I just adore and respect her so much." "I have a hard time standing still when people are looking at me. That's why photo shoots never work out very well. who can make me feel really comfortable." any superhero could ever ask for." where she provides operational support to Clark and Oliver and their team of heroes. and then managed the Isis Foundation. "I love how tenacious she is. And I love how loyal she is, and trustworthy, and intelligent, and brave, like, she's SO brave. She's so brave, and she does these outrageous things because of her commitment to her best friend, and I think that's so honorable, and I love the fact that she's a woman in a man's world and she doesn't let that stop her... In every aspect, in journalism and in the hero world. She's a really strong girl, and she holds her own, and I think that that's pretty awesome." - Season of holidays: Christmas, New Year, Chloe's Return! - Countdown to January 28! But you made a pretty good choice, though. It's my favorite. I'd add the link to the opening post, but it looks like it's a specific shape... where should I add it, if you want me to add it? Oh okay I guess the thread starter can edit it in as well, if they want to. Thanks for all those links, Naomi!